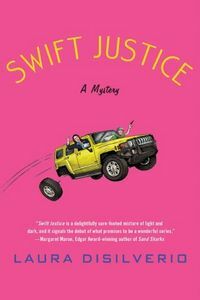 Swift Justice by Laura DiSilverio, a Mysterious Review. Review: Solo private investigator Charlotte "Charlie" Swift suddenly discovers her silent partner has taken off for parts unknown, leaving his half of her business to his not-so-silent wife, in Swift Justice, the first mystery in this series by Laura DiSiliverio. Georgia "Gigi" Goldman, left without any means of financial support, decides to learn how to be an investigator, and who better to show her the ropes than her new partner, Charlie. Except Charlie works alone, a point she repeatedly makes to no avail. However, Charlie's latest case — searching for the daughter of Melissa Lloyd, who gave her up for adoption 17 years ago and hasn't seen her since, but who has now left her own daughter, Melissa's granddaughter Olivia, with Melissa before vanishing herself — takes a step forward with a keen observation made by Gigi. Though reluctant for Gigi to get involved, Charlie accepts her help in finding the woman, now known as Beth. But the case takes a tragic turn when a murdered Jane Doe turns out to be Beth, leaving Charlie uncertain as to how to proceed. Swift Justice presents a convincing interplay of a comic odd couple pursuing a serious murder investigation. The characters, Charlie and Gigi, are well drawn and in their own way uniquely matched here; their different, often opposing, views on how best to contribute to the success of their new partnership can be quite entertaining. Charlie's missing persons — now homicide — case has a dark side, however, yet the author doesn't trivialize this by extending to it the humor generated between the pair. It may seem to be a tricky balancing act, but it works here. Now that Charlie and Gigi are partners — the newness of it all out of the way, as it were — it will be interesting to see how these two characters continue to develop in subsequent mysteries. Acknowledgment: Minotaur Books provided a copy of Swift Justice for this review.